Over the past few weeks, the U.S. has been hit hard with record breaking cold temperatures and snow storms. While the Midwest seems to be getting the brunt of the storms, Boston has been slammed with quite a few. When snow storms hit Boston, most of the population becomes housebound, as the roads are just too difficult (and often times too dangerous) to drive on. It’s times like these that I’m glad I live in a place with great public transportation and that I’m walking distance from some really good eateries. As such, I thought this would be a good time to look at some of the local restaurants in Brighton that I frequent and that take in the stir crazy after a storm with a new series I’m calling: Surviving in Hoth (a reference to the snow and ice planet in Star Wars: The Empire Strikes Back, in case you’re not a nerd like me and don’t recognize the name). 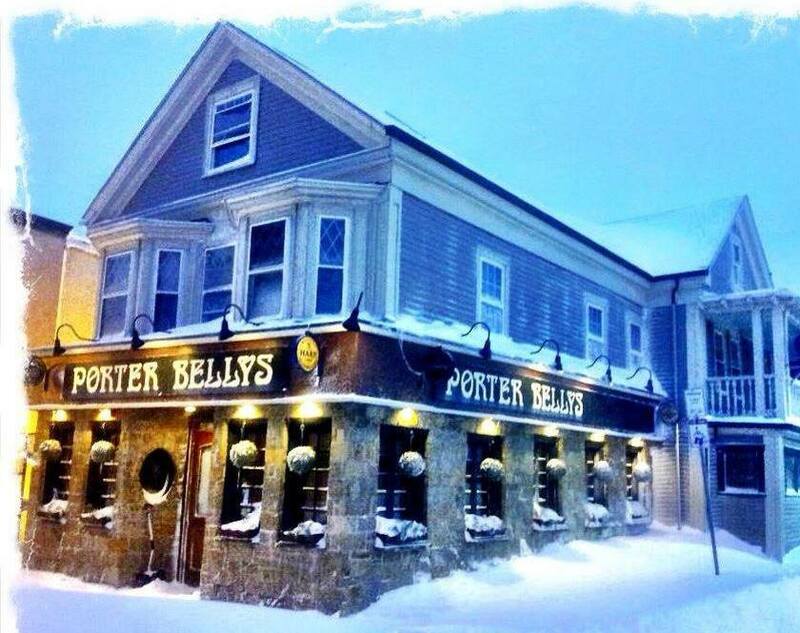 Porter Belly’s, located in the heart of Brighton Center, has been my local watering hole since I moved here in 2010. It’s a laid-back Irish pub with a good selection of drinks and food. There are a lot of “pubs” in Boston, since the Irish population is very prevalent here. However, Porter Belly’s is unique. It’s one of those places that has a very welcoming atmosphere, which in my opinion, can be a difficult note to strike. I personally am not a huge fan of bars that are overly “townie” (i.e. dominated by locals that have lived in the neighborhood all their lives and tend to give attitude or looks to outsiders), too trendy, uptight or dominated by college students (which can be tough in a neighborhood like Brighton, that draws in college kids with lower rental rates). To me, Porter Belly’s doesn’t fall into any of these buckets but rather it’s customers and staff are a diverse mix of the population of Boston. When I describe the bar to my out-of-town friends, I frequently say that the bar reminds me of McClaren’s from How I Met Your Mother, which is fitting for this blog, right? Outside of the atmosphere and customer base, Porter Belly’s offers a great food menu with burgers, sandwiches, salads and dinner options. The burgers are always fantastic — I don’t think you can go wrong with any of the food really — but somewhat unexpected to those who have never been to the pub is it’s Chicken Curry. The dish is made up of a yellow curry that packs a lot of flavor, but not too much spice, with generous portions of chicken, carrots, peas, onions and peppers on top of either rice, french fries or both. I always recommend this to those looking for something to warm them up, which right now, is a number one priority. However, if you’re not sure about the curry, try getting a side of the sauce with your burger or sandwich for your fries. *Disclaimer: I recommend checking their Facebook page to look at updated hours during storms but at least, during the last few major storms, they’ve found a way to open their doors…if not during the storm itself, a few hours after it’s over. This entry was posted on Monday, January 13th, 2014 at 8:00 am	and tagged with brighton, porter belly's, pub, restaurant, winter and posted in Food. You can follow any responses to this entry through the RSS 2.0 feed.